How do you know? The Beatles gave multiple interviews on the terror of being in that country under the newly-elected Marcoses. Keep reading. That was how bad Philippines was under the Marcoses regime. It was like a hell. Thanks to Cory Aquino for bringing back democracy. Great post! Came across this post whilst searching Beatlemania / Apple Scruffs! The Beatles are my favorite band and this article was very interesting. Very informative too. Paul was my favorite growing up but John has been the most interesting one to read about. Alix, this experience scared the Beatles so badly they never toured again. Thank you so much for posting this article. No one believes me when I tell them this story. We get very few foreign musical acts in Manila because of this incident, even Madonna has mentioned that she will never play in Manila as a result. What is sad is that Filipinos love music and the Beatles and Mrs. Marcos’ insanity has ruined things for the rest of us. It is also not an exaggeration, she is seriously psychopathic. She killed so many people building the Manila Film Center by burying them in cement. I can’t believe shes running for Congress. Apparently, before arriving in Manila, the Beatles thought we still lived in huts. Wow! I didn’t know the Beatles thing in Manila still caused problems for the country. Thanks for your interesting comments and please come back. As a huge Beatles fan born in 1980, I have read blurbs and seen short clips regarding “the manila debacle” but have never read an actual play-by-play article. However, if I’m not mistaken, in 1966 Ferdinand Marcos was one year into his first term of presidency, and martial law was not declared until September 23, 1972, after his second presidential term had ended. Karaleigh, I appreciate the correction. I’ve edited my article to reflect that martial law was not in place in 1966. Please keep coming back. I appreciate your comments and thank you for your kudos. Super interesting article! I came across it when I heard a story on the Marcoses on NPR tonight. I googled Imelda and you came up! Thanks again! I’ll have to check out the story on NPR. Glad you visited; keep coming back to Lisa’s History Room. I am a student and i was wondering if i could use one of your photos of the Beatlemania for a PowerPoint that i would only use in a presentation for my coursework. exaggeration! Im a filipino and as far as i know that only in their hotel and in the airport had in trouble, so i did not believe in some info. Trouble in their hotel and in the airport is all the info I need to know what a tyrant Imelda is. The Marcoses were part of the reason my mother left the Philippines. 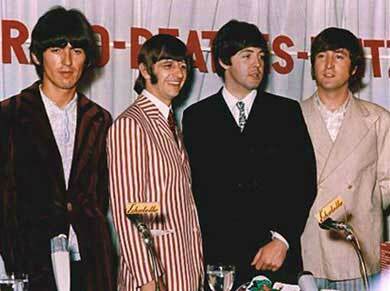 I’ve always thought that the Beatles snubbed IM’s invitation. I wasn’t even in school yet when Martial Law ended, so I could not imagine how evil Imelda was then. Your blog has enlightened me. beatles songs are forever but marcoses are not forever…JESUS CHRIST is forever but the beatles are not forever. I don’t think this is an exaggeration. Although I wasn’t born yet at this time, I read several posts on this topic. 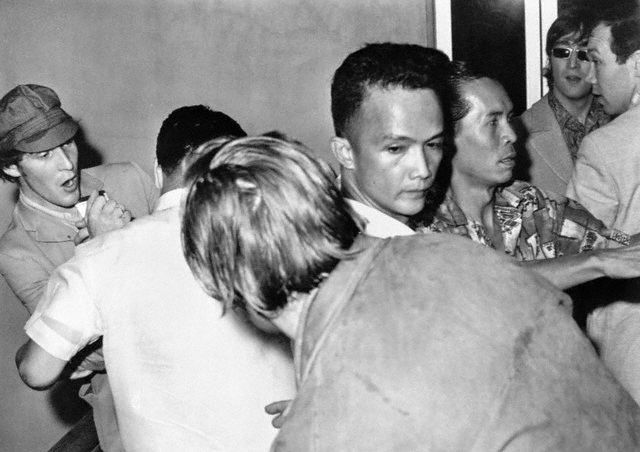 I’m a Filipino and I do think that the things Imelda did during their reign scarred the Philippines. And those who were included in the mob were probably either scared to decline orders or were hungry for money. Some people takes Philippines for granted… perhaps, this teach them a lesson. I am for MARCOS… and several years after his death… We are still for MARCOS…. Millions of us. I seem to recall John Lennon calling the Marcos government fascist. And it was for Bongbong Marcos’s birthday party, btw. And the Beatles were expected to perform for free — libre. I’d just like to say that as of now, half of your Filipino fans were not born yet when you had your concert in Manila, so I hope you don’t have any hard feelings for the race anymore (have pity to your young fans). How I wish that incident didn’t happen, you might have returned for another show if it weren’t for that near-death experience here. Today the dictatorship has long gone, Marcos is 20 years dead. Imelda’s still alive but I don’t think the young generation cares, and I’m sure that your fanbase here will continue to grow as the population of this hot 3rd world country continues to increase. Filipino fans will forever love and appreciate your music, whether you come back here or not. Reblogged this on Ka Bino Guerrero. Hi Lisa! I come from the Philippines and this is one part of our history I hate so much because I am a Beatlemaniac! I wish this never happened. Your article is great! I agree with “ixaxaxa.” The wrong doing of few Filipinos doesn’t define the Filipino race as a whole. I wasn’t born during the 1960s but I am a certified Beatle fanatic! Is it true that John Lennon said “We are here to perform a concert, not to drink pineapple juice in the president’s house”? James, I’d love to know that answer! Sorry but I had to set the record straight. First of all the Beatles was never booked at Manila Hotel for the simple reason no 5 Star would accept because they are afraid of unruly Beatle Fans. They stay in a yacht along Manila Bay. How do I know this it’s all in the newspapers ( Manila Times is only newspaper I read at that time) if Manila Times still have microfilm of issues this will bear me out. It’s true they were mod at the airport. I believe this is just to make the Marcoses look bad. So almost half of story is fadricated . This is a case simple miscommunication between the promoter and The manager of the Beatles. Btw I did watch their evening show. Enrique, the Beatles were booked at the Manila Hotel. They arrived there at about 4 a.m. the day of their concert. Before that time, they had been at a party on a private yacht. The story of their terrifying ordeal in Manila is true. Nothing has been fabricated. The fiction is the belief that the Marcoses are good people. They were murderers, thugs, and thieves. Deliberate threats or not? Exaggerated story or facts? As long as this incident took place under his term of presidency, it speaks badly about Marcos’ administration either way. He have ridiculed his own leadership. As one of the aficionados, I witnessed The Beatles concert at the Rizal Memorial Football Stadium on 04 Jul 1966, 4-6PM. They performed so well and very enjoyable. BONGBONG MARCOS must never be allowed to win. Even though he is not his father but he denied the atrocities during the martial law. NEVER AGAIN A MARTIAL LAW! I love your article. My only small comment to refine yiur article is about “people shouting in Spanish and English.” Maybe you can say Tagalog or local language instead of Spanish.